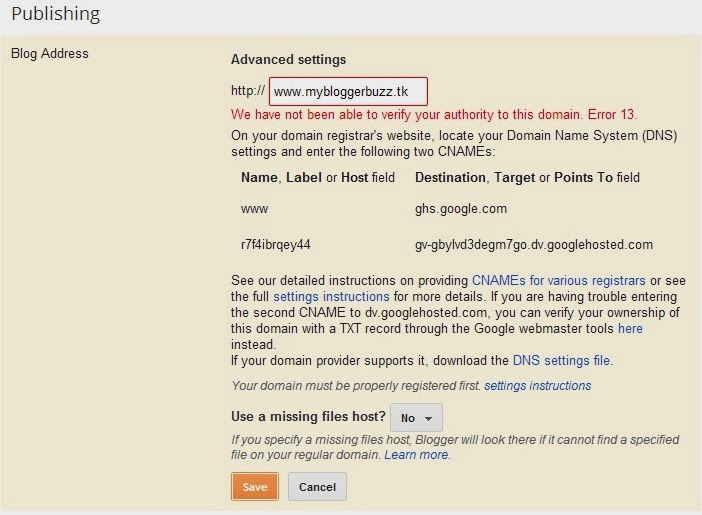 My Blogger Buzz: How to Setup Free .Tk Domain as Custom Domain for Blogger? A Domain name is very important for any website because that is your site link or name and people remember your site with this name. If your website domain is more attractive and valuable then mostly people are again want to visit it, but if you utilize huge hard work on a sub domain and also you produce excellent content then the visitors not give more value on your site, so that's why we have to got one domain for the blog. 1. First of all go to dot.tk website. 2. Know enter here your desire domain and click on “Go” button, same below screenshot. 3. If domain is available then you redirect on registration page. If not, then try any other. 4. 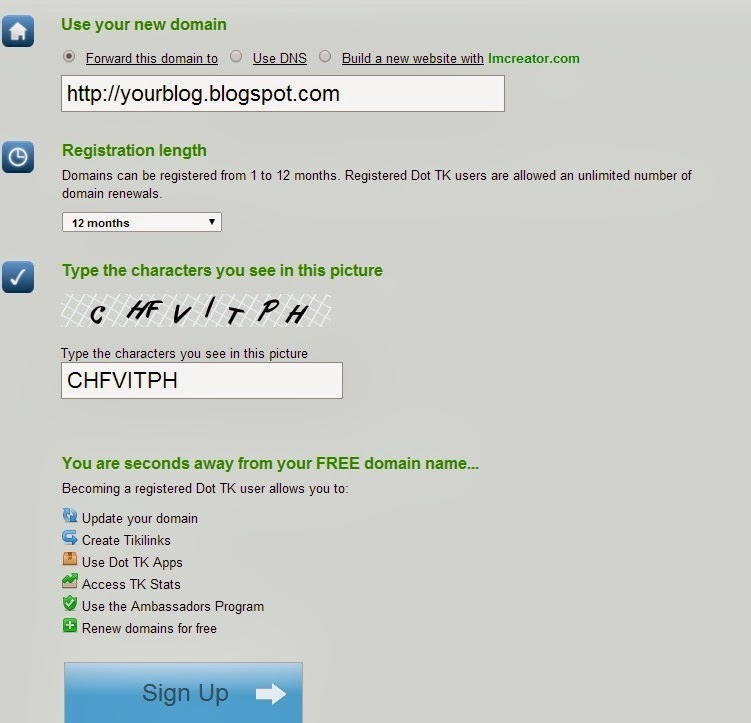 When you see Registration form then enter here your .blogspot.com domain, select 12 months registration, enter captcha and then click on Sign up, same below screenshot. (Tip: You can also use any social network for sign-up). 5. Know they will send you confirm link on your e-mail address, so confirm it. 2. Know enter here your .tk domain and click on “Save” same below screenshot. 3. When you click on “Save” you got error, same below screenshot. 4. Know go to your dot.tk account and click on Domain Panel and then click on “Modify” same below screenshot. 5. Know you see one new window and click on “Dot Tk DNS Service” same below screenshot. 6. First of all Select “CNAME Record” from type option and then write “www” in Host name and “ghs.google.com” in IP Address and click on “Add new” same below screenshot. 7. Again Select “CNAME Record” from type and then write Host name and IP Address that you got in error, see step 3. You can don it same below screenshot. 8. After it select “A Record” from type and enter your domain in Hostname and enter “216.239.32.21” in IP Address and finally click on “Add new” same below screenshot. 9. After adding 2 “CNAME Record” and 1 “A Record” so finally click on “Save Changes” same below screenshot. 10. Now! Wait around 1 to 2 hour and then log-in to your blogger account and got to Setting>>Basic>> Add a Custom Domain and enter your .tk domain and click on “Save”. Blogger will save your setting and view the new look of your site with custom domain. Congrats! Now You owned a custom domain blogger blog which set up without any charges. Now It's your turn to share this post with your friends and write your views in comments till then Peace, Blessings and Happy Blogging.